Internet usage in India has witnessed an enormous growth in last few years. The wireless data usage in 2017 has increased from 20,092 million GB per year from 828 million GB per year in 2014, showing a growth of more than 24 times. This increasing use of data is causing congestion in the existing bands which finally affects the quality of services provided to consumers. In order to cater to this surge in data consumption, it is essential that there should be a commensurate increase in the supply of broadband internet. Perhaps the approach to the supply also needs to change. Availability of additional spectrum is an important piece of this puzzle. V-band (57 GHz - 64 GHz) and E-band (71-76 GHz and 81-86 GHz) are two microwave bands which can be useful for bridging this need for additional spectrum. Spectrum in these bands can be used for high capacity data transmissions for last mile connectivity over short distances ranging from 200 meters to 3 km. These bands can be put to a variety of backhaul (i.e. for connecting towers). V-band can also be used for access under the Wi-Gig standards. It has recently been reported that the Department of Telecommunications is weighing administrative allocation as the method for releasing the spectrum in the E-band and V-band, and it will take the Attorney General's opinion in this regard. This legal opinion is considered necessary because of the Supreme Court's judgment in the 2G case. The allegations of irregularity in 2G spectrum allocation led to judicial scrutiny of the method of allocation and also much public discussion. The Supreme Court quashed several spectrum licenses granted due to irregularities in the manner of allocation of spectrum to licensees on the first-come-first-served basis. After a Presidential reference, the Supreme Court had clarified that it is the prerogative of the Government to decide the methodology of alienation of other public resources, provided the method is transparent, fair and backed by social or welfare purpose. The Court also stated that revenue maximization need not be the sole objective while alienating public resources and in fact, this is subservient to the goal of serving the common good of the society. Therefore, as the Government decides to release this presently unreleased spectrum, it should consider the overall economic impacts of the alternative strategies for releasing the spectrum. On this issue, we recently published a Working Paper that provides an overview of the uses of V-band and E-band spectrum, and how we may think about choosing a suitable method for releasing this spectrum. This article gives an overview of the paper. There can be four main approaches to releasing the spectrum. First, Individual authorization with individual licensing is the conventional link-by-link allocation involving individual frequency planning/coordination. In this method, the allocation of spectrum is usually done using traditional procedures for issuing licenses, which involves a selection process by the administration. Sometimes, the administration delegates this task to the operators, but it keeps control of the national and cross-border interference situation. Second, individual authorization with light licensing is also a method of giving exclusive usage authorization to certain service providers for a period of time, but the method of licensing is simpler and may involve 'first come first served' procedures. In this method, allocating authority typically places a limitation on the number of users in a given area. Third, general authorization with light licensing is a combination of license-exempt use and some degree of protection of users of spectrum. There is no individual frequency coordination, but the user is required to notify the authorities of the position and characteristics of the links. The database of installed stations containing appropriate technical parameters is publicly available. Importantly, in this method, there is no limitation on the number of users. Fourth, the license-exempt method offers the most flexible and low-cost usage of spectrum. It does not require even notification or registration and does not mandate any individual frequency coordination. This method has worked well in specific bands (e.g. 2.4 and 5.8 GHz used for Wi-Fi access) where short-range devices are allocated, but fixed service applications may also be accommodated. Although this does not guarantee any interference protection by the regulator, alternate interference management techniques are available to deal with the issue. In addition to these approaches, there are block assignment regimes, where the assignment is made through renewable licensing or through permanent public auctions, or through other allocation mechanisms. Although the auction is often assumed to be the most suitable method for allocating spectrum, studies on unlicensed spectrum suggest that such availability of spectrum can also lead to significant benefits for the economy, many of which seem to be arising out of unpredictable uses, which may not have occurred if the spectrum had been auctioned. One interesting example is the use of RFID in the clothing sector. According to a study done in 2014, this use generated about USD 100 billion of annual benefits for the US economy. Arguably, if the usage of this spectrum had been restricted, this usage would not have scaled up in such manner. It is important to understand that absence of auction is not the same as giving arbitrary benefits to hand-picked service providers. If the regime is open and transparent, the spectrum can be made available for use by a variety of potential service providers and users without giving an unfair advantage to anyone in particular. Most countries acknowledge that certain spectrum bands are best left unlicensed, or may be subjected to a "light touch" licensing regime, with minimal regulation. In India also, a number of spectrum bands are unlicensed, like 2.4 GHz and 5.8 GHz spectrum bands used for Wi-Fi access; 865 MHz - 867 MHz band used by RFID devices; 402 MHz - 405 MHz spectrum band used for medical wireless devices; and so on. A number of countries have adopted license free frameworks for adopting the V-band, including USA, UK, Switzerland, Japan, Korea, China, Canada, Malaysia, and the Philippines. Although international experience is useful, we also need to consider Indian context, and how this spectrum may be put to use in this context. In the paper, we consider the various potential uses of this spectrum and attempt to quantify the scale of this usage in an optimal scenario. 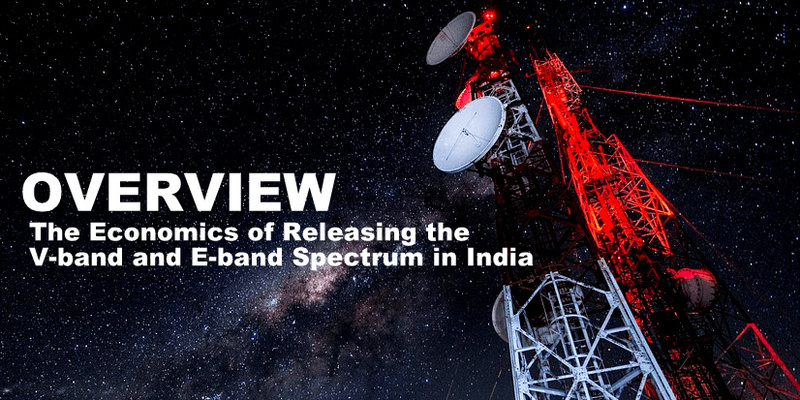 The context of broadband Internet in India will determine the kinds of benefits that India can get from V-band and E-band. There are certain key aspects of this context. First, in India, most users access the broadband internet through wireless networks. However, wireless broadband networks have certain limitations. In densely populated areas, as more people get on to wireless broadband, the mobile spectrum bands may get congested. This necessitates more cell sites and higher backhaul speeds. Compared to wired connections, especially fiber optic connections, mobile broadband provides lower speeds and less consistent connectivity. Further, a low density of wired connections constrains the potential of developing community hotspots, where residential or business short-range networks are made available for use by other users of the network. Globally, the proliferation of such hotspots is one of the most remarkable stories in the growth of the Internet in recent years. Such hotspots provide high speed, consistent connectivity while offloading from mobile networks - a benefit that India will not be able to realize without the proliferation of fixed broadband connections. Second, a negligible percentage of the fixed broadband connections are fiber optic-based. Most of the wired connections use DSL, Dial-up, or Ethernet, all of which offer potentially lower speeds than fiber optic. This situation is very different from what is seen in developed countries, and also incomparable developing countries. Third, India has a low density of commercial Wi-Fi hotspots. Such hotspots can help augment the mobile broadband and private residential and commercial hotspots as well as mobile broadband. Use of public Wi-Fi can help offer consistent, reliable and high-speed Internet to users while decongesting mobile broadband. India has only about 36,270 public Wi-Fi hotspots. The total number of public Wi-Fi hotspots in the world is over 12 million. In the coming years, the main challenges for internet access in India are likely to be round consistency and quality of access. To address these challenges, the intermediate policy goals for broadband Internet India should be: expanding access to fixed broadband; decongestion of mobile broadband in dense urban environments; and proliferating Wi-Fi hotspots. Achieving these intermediate goals would help improve quality and consistency of internet access in India. This will not happen automatically and requires policy focus, which may begin with rethinking spectrum allocation methods for these spectrum bands. Support proliferation of commercial Wi-Fi and Wi-Gig hotspots: these bands can help backhaul the commercial Wi-Fi infrastructure in a cheaper and quicker manner, especially in dense urban locations. These bands can also promote the proliferation of Wi-Gig hotspots. Wi-Gig networks use V-band which provides wider channels than standard Wi-Fi, resulting in significantly faster data speeds. Support expansion of the fixed broadband Internet in urban areas: these bands can help solve the last mile problems of getting high speed wired broadband Internet into dense urban locations. Backhaul for mobile broadband: these bands can provide higher capacity backhaul for mobile broadband, thereby easing congestion. Other uses: these bands can be put to a variety of other uses. These, inter alia, include an extension of local area networks between buildings within a building complex; Internet of Things (IoT); Vehicle to vehicle communication and Augmented Reality (AR)/Virtual Reality (VR) Systems among others. Given India context of high urban population density and many urban areas with old and dense construction, the scale of usage of these spectrum bands is likely to be quite high. We tentatively find that if these spectrum bands are allowed to be used optimally, they could lead to improved speed of internet, increased consistency in internet access, and greater volume of internet usage. However, there are many potential uses of this spectrum that are difficult to predict at present. For instance, the potential for IoT is very difficult to predict at the moment, albeit a lot is being said about how far IoT can go. These are early days for the adoption of this spectrum and the allocation method should take into account this uncertainty about the potential uses. In choosing a method for releasing this spectrum, the focus should be on maximizing the net benefit for the society as a whole. Given the paucity of relevant data and earlier studies, we are unable to reasonably monetize the economic value of these benefits. However, we attempt to map the types of uses with various types of economic benefits that may accrue from them. If the V-band and E-band spectrum are de-licensed or lightly licensed, the pass-through cost of this spectrum will be zero or very small, and the only substantial cost will be installation costs. In a competitive market, ceteris paribus, reduction in costs will lead to lower prices for consumers. Given the price elasticity of demand for internet and the rapid evolution of technology, this availability will lead to higher usage of broadband internet by consumers, allow new consumers to use broadband internet and enable innovative business models and technologies. The use of these spectrum bands will lead to a reduction in costs and create an opportunity to reach hitherto unreachable locations in dense urban environments with high-speed Internet. This will lead to a shift in the supply curve so that more quantity is made available at a given price. If the quality of Internet access improves, as is expected from the use of V-band and E-band, there may also be a shift in the demand curve, as users may be willing to pay more for the connection. Quality improvement also has larger economic benefits. For instance, if the speed of Internet usage increases, users will be able to put their connections to a wider variety of uses, especially in commercial contexts. Following are the key economic benefits expected to arise from the uses of V-band and E-band spectrum. It should be noted that all these benefits cannot be fully attributed to these spectrum bands. Some of them, such as benefits from Wi-Gig devices, may be fully attributed to these spectrum bands because they rely completely on the availability of this spectrum. Other benefits can be partially attributed to these bands. Producer surplus due to offloading from mobile broadband: Producer surplus usually increases if the cost somehow falls without a change in the price charged. It can also increase if the price increases without corresponding increase in costs. The use of these spectrum bands would enable offloading from mobile broadband which will generate producer surplus. Producer surplus from lower backhaul costs for mobile broadband: Lower backhaul costs could lead to producer surplus for mobile broadband service providers. This can be calculated by comparing the costs of backhaul using V-band and E-band with the cost of establishing infrastructure for a similar quality of service using other backhaul solutions, such as fiber optic cables. Most of this surplus would arise in congested areas. Consumer surplus from the use of commercial Wi-Fi hotspots and fixed broadband: Consumer surplus is the benefit that consumer derives from the use of a service or good. A variety of sources for consumer surplus can be identified on the basis of the uses of V-band and E-band presented in the previous section: consumer surplus from commercial Wi-Fi in dense locations; consumer surplus from free Internet given by Wi-Fi hotspot providers; consumer surplus from greater use of Wi-Fi and Wi-Gig devices; consumer surplus from indoor use of fixed broadband. GDP contributions: In addition to consumer surplus and producer surplus, there are also GDP contributions that may arise from the use of this spectrum. These are mostly in terms of new or improved businesses and technologies that are enabled by this spectrum band, such as usage of commercial Wi-Fi and Wi-Gig hotspots, higher speed of internet, Wi-Fi and Wi-Gig device sales, new or modified businesses and technologies (eg. IoT). Since most of these benefits will accrue to consumers and producers, this will also create the potential for the Government to extract part of this benefit as additional tax collection. For instance, the sale of devices and provision of services will create opportunities for the Government to collect taxes from these activities. Further, to the extent that these activities will lead to additional profits for service providers, part of that profit will be taxed by the Government. The concern that the Government may lose out on some non-tax revenue if it chooses to delicense this spectrum may be overcome by these revenue opportunities. Further, in light licensing regimes, some fees may also be levied on the usage of the band. However, as discussed earlier, keeping the fees high may impede usage of these bands, and may discourage some types of usage that may generate significant economic benefits. The experience of Wi-Fi and RFID spectrum supports this contention. In conclusion, four key takeaways emerge from this analysis. First, while choosing a method for releasing this spectrum, the focus should be on ensuring maximum aggregate benefits for the society, and not short-term revenue maximization for the Government. Among other things, this means that the potential of these bands to help improve India's overall system of broadband Internet access should be realized. Some of the major limitations in the present system could be partially overcome by use of these spectrum bands, along with other suitable policy measures. Second, although the economic benefits of these spectrum bands are likely to be substantial, studies on economic benefits of previously unlicensed spectrum bands suggest that the variety and scale of economic benefits may increase over a period of time if easy access to spectrum is enabled. As has happened with other unlicensed spectrum bands, innovation and competition may lead to many types of uses that are difficult to anticipate at present. Hence, it would make sense to liberalize the spectrum without any cumbersome procedures or high fees. Third, many of the benefits are not realized by the service providers and accrue in terms of consumer surplus and GDP contributions of businesses and technological innovations spurred by the availability of this spectrum. If the Government decides to target revenue maximization while allocating the spectrum, it will mainly be able to extract part of the producer surplus. However, this will have an effect on proliferation and therefore, on consumer surplus and GDP contributions. This may lead to significantly lower economic benefits of the spectrum for the economy as a whole. So, it may be better to not allocate this spectrum based on methods of individual authorization. Instead, general authorization with light licensing or license-exempt approaches may be explored. These approaches also allow the government to extract part of the economic benefits later, especially in the form of taxes. Fourth, in thinking about the strategy to release the spectrum, it is important to align with global device ecosystems and standards, so that India can benefit from economies of scale in the production of devices, and potentially become a manufacturing hub for the devices. This article was originally published at Dr. Ajay Shah's blog on May 29, 2018. All rights reserved by the author and original publisher.